in general it's good for me because i don't have to modify the file then, but i just want to understand why :) maybe because the chd-files are indexed already in gamelist.xml of system megadrive? if it's because auf gamelist xml, this theory seems to be valid just for file extensions only: because on the other hand tags for cores in gamelist.xml that are not present in es_systems.cfg are defenitely ingored. for example when using core fbalpha in system mame. It seems even this is not recommended at all, it still works - also after updated to 6.0 DragonBlaze. So my question is, can I leave it this way, or is there a risk this modification is destroyed by future recalbox updates? 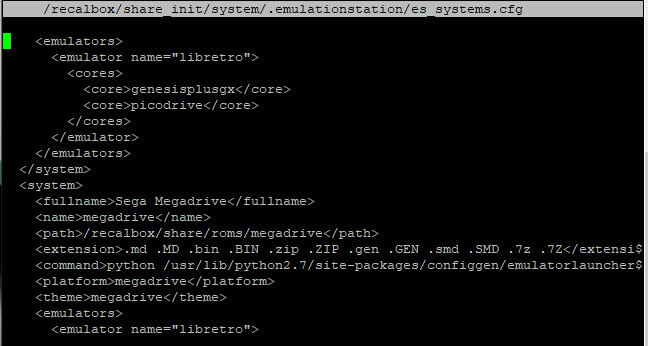 If there is a risk, I'd like to migrate this mods to /recalbox/share/system/.emulationstation/es_system.cfg, like suggested. But will this be even possible? Will ES read such modification there or ignore it? Sorry if my request is unnecessary, but I don't understand 100% how this custom cfg should look like and my mod will even work at the suggested directory. Thank you very much in advance for clarifying. @myst I guess it‘s because i just copied backgrounds and sound. did not want to replace too much, as i didn‘t want system pictures, etc. change to pcenginecd. i‘ll try, thanks for info. as these rating files are so small, i’m wondering even more about a weird problem i still have: when i quit an emulator, ONLY these rating graphics are white blocks for a short time sometimes... after not more than one second when left emulator, they are shown properly again. on the other hand no problem with other, big graphics like backgrounds. so can‘t be a memory issue all. maybe an es-thing? it‘s the only disturbing issue left, everything else is fine now, both with theme 1.0 and rb 6.0. maybe @paradadf has an idea? Have now rebooted many times and couldn‘t reproduce it anymore. no idea what it was. saw every video, old ones, new ones and even latest konami. so please ignore my last post. in which file are graphics for game rating stored?